There are very few things in this world that are pretty much unsurpassed in the sheer beauty of their construction. One example is the Bugatti Veyron -- the fastest, most powerful and most expensive street-legal production car in the world. With an incredible 1001 horsepower and the ability to rocket from 0-60 in a mere 2.46 seconds, this engineering marvel, built in the Alsace, is definitely one example that comes to mind. The same can be said for the resplendent silhouette of the Lockheed Constellation, generally considered to be the most graceful airliner to ever slip the surly bonds of earth. And who would argue that the Orient Express was, in its heyday, the most stylish, elegant and comfortable mode of rail travel known to man? This brings me to A VERY LONG ENGAGEMENT, which I believe is the most visually stunning motion picture to grace the silver screen since 2001: A SPACE ODYSSEY. Folks, it doesn't get much better than this. There's intrigue, mystery, humor, humanity, romance and more -- all magnificently crafted by Director Jean-Pierre Jeunet. With the help of Guillaume Laurant, Jeunet has exquisitely captured the heart and spirit of the acclaimed novel by Sebastien Japrisot. With production values that have to be seen to be believed and the phenomenal performance by Audry Tauto to tie together the multi-dimensional, complex story, A VERY LONG ENGAGEMENT is nothing short of a cinematic masterpiece. Lightning can and does strike twice; Tauto teamed with Jeunet to triumph just three years earlier with the immensely endearing AMELIE -- the Best Film of 2001 in this reviewer's opinion. If you only rent one DVD this year from your local Blockbuster, A VERY LONG ENGAGEMENT is the one to take home. DELTA FARCE and BLADES OF GLORY be damned. The film opens with five French soldiers being condemned to death during the Battle of the Somme in World War I. Each has shot himself in an attempt to be sent back home, but their individual efforts backfire as each is systematically court-martialed and sentenced to be banished, hands tied to their backs, to No Man's Land where they will surely be killed by German troops who are entrenched only a few hundred yards from where the French lines begin. One by one we are presented background information about these men and their next of kin. One by one they meet death in the open battlefield -- or do they? Methilde (Tauto) is a young peasant girl afflicted by polio when she was a child. Her fiancee is one of the condemned men, but despite all the evidence to the contrary, she steadfastly refuses to believe he is dead. What follows is a remarkable journey that takes her (and us) to the absolute height and depth of humanity. "The War To End All Wars" was brutal and horrific in every sense of the word. 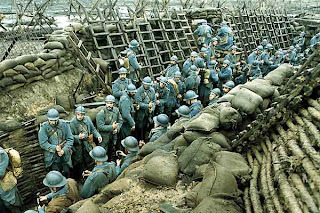 Not since Stanley Kubrick's haunting PATHS OF GLORY (1957) has the absurdity of war and the tremendous cost of each and every life lost been so compellingly portrayed. Appropriately, such an epic theme deserves epic treatment. What makes A VERY LONG ENGAGEMENT so effective and so engaging is that Jeunet's stylish blend of visual mastery and emotional intimacy combine to not only deliver an extremely visceral anti-war film, but an intricate, unforgettable, heartfelt love story as well. Un Long Dimanche De Fiancailles: C'est un film exceptionnel. Vous devez le voir. Yes, we did reference the famous poem by John Gillespie Magee, Jr. and we are guilty as charged. Thank you for bringing these errors to our attention -- the posting has been corrected.